Advertising is all around us. But it’s amazing how many people starting small home-based businesses don’t consider its power. 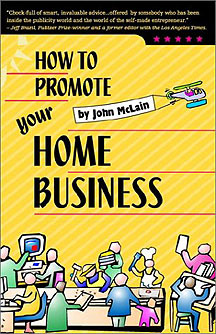 In a mere 115 pages, John McLain has produced a promotional handbook for beginning home entrepreneurs. McLain emphasizes the importance of not only a written business plan but a marketing plan, as well. He stresses setting up a budget and a timeline for promotional efforts. The home business usually has a staff of one. The owner is also the company president, support staff, bookkeeper, janitor and, yes, advertising person. McLain’s book helps the already overburdened home business owner by giving concrete suggestions for efficient promotion. The author emphasizes the importance of publicity. "Let’s face it. It’s cheaper than advertising," says McLain. He effectively instructs his readers on how to structure a press release. Unfortunately, he fails to provide a sample of one. For the novices reading this book, samples are very important. Advertising takes many forms. McLain covers it all–albeit superficially–from brochures and pamplets to direct mail campaigns and talks to community groups. He presents his material in a clear, straight-forward manner, supplemented with anecdotes and sayings seemingly written in the margins, but actually printed along with the text. These annotations don’t really add to the information in the book and could have been left out. This little book is perfect for someone contemplating or just starting a home-based business. It’s a bit too basic for seasoned entrepreneurs.